The rule of law is a fundamental concept known to all students of the law. Its essence lies in the principle that the law is the highest rule of the land, above all things and people. This forms the cornerstone of civilized and functioning societies at a national level. As we may observe, the idealistic realm of rule of law is at times infringed and abused, which leads to power struggles among public figures and violations of human rights and basic freedoms. Does this then suggest a futility of the imposition of rule of law in our systems today? What would happen had it not been introduced at all in the first place? This is an area of constant academic discussion as it embodies vital elements which affect legislation, governance and, ultimately, the delivery of justice. 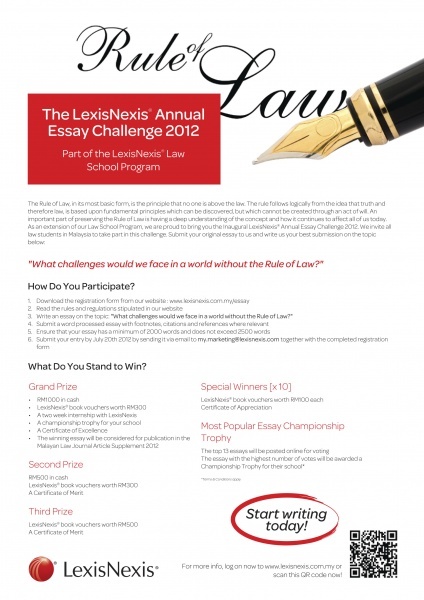 The LexisNexis Essay Challenge presents you with the opportunity to posit your thoughts on the issue – what challenges would we face in a world without rule of law? Expand your arguments in a 2000-2500 word piece and stand a chance to win fabulous prizes! As citizens and stakeholders in a country professing democracy, it is certainly a treasure to have your contribution that may possibly sharpen the points on rule of law, where they may have become blunt over time and neglect. We are now pleased to announce the winners of this challenge. Congratulations to all winners!